Edelbrock Air Cleaners - Pro-Flo Series - Dezod Motorsports Inc - Home of the automotive performance enthusiast since 2002. Edelbrock triple chrome-plated round air cleaners work with all popular 5-1/8” diameter carburetors (Performer Series, Thunder Series AVS, Holley, Thermo-Quad, Quadrajet and Carter AFB). The 10” and 14” models have knock-outs in the air cleaner base and include an adapter for crankcase ventilation. #1208, #1209 and #1221 fit all Edelbrock carburetors. Heights of air cleaners are in parentheses, measured from the gasket flange to the top of the supplied retaining nut. Dimensions are accurate within 1/8”. Available for Edelbrock single- and dual-quad applications, these oval air cleaners clear HEI distributors and all stock components. #1235 fits Edelbrock low profile dual-quad manifolds and others with 6-7/16” carb center-to-center. They come with high-quality 2-1/2” washable, pre-oiled cotton gauze filter for excellent filtration. Overall dimension is 13-1/2” x 7”. The Signature Series triangular air cleaner is a new style with a shape reminiscent of the muscle car era. 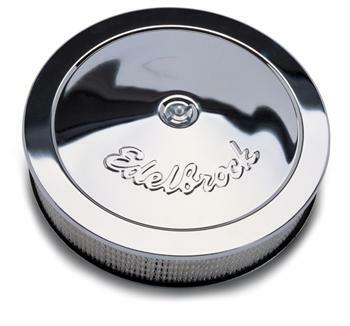 This hot looking chrome air cleaner has the classic Edelbrock signature. This triangular air cleaner comes with high-quality 2-1/2” washable, pre-oiled cotton gauze filter for excellent filtration. Designed for use with 5-1/8” diameter carbs (Edelbrock square-bore, Q-Jet, etc. ), the Pro-Flo #1222 clears HEI distributors and electric choke housings. Air cleaner dimensions: 14-1/8” wide x 13-3/8” long. To keep your engine running clean, replace the original filter element in your Edelbrock air cleaner with a new element every 3000 miles (sooner in dusty areas). We recommend #1217, #1218 and #1219 replacement elements for any similar design air cleaner. Pro-Flo 1000 Series, with the popular reusable air filter, offers superior flow capacity, low profile, good filtration, performance benefits and long-term savings. Pro-Flo 1000 is an economical and effective way to keep clean air feeding your engine without the expense of a new filter every few thousand miles. Inside every Edelbrock Pro-Flo 1000 Series, you’ll find our exclusive reticulated urethane foam element. Maintaining Pro-Flo’s foam element is simple. Just release the spring clip, remove the element, wash in hot, soapy water. Rinse, dry and reassemble. Should you need to replace your foam element, replacement element (#1099) is available. For superior flow capacity, performance and economy, choose Pro-Flo 1000 Series reusable air filters.